It wasn't CU-Boulder making headlines for cry rooms and therapy dogs after the election. The University of Colorado's flagship campus stands out among its peers for academic excellence and relative cultural sanity. So it is no surprise the university has harbored one of the world's most knowledgeable climate change skeptics, despite relentless efforts by media types, billionaire activists and the Obama administration to silence and destroy him. Prof. Roger Pielke, Jr., has long been a professor in the Environmental Studies Program at CU. He has won impressive awards, served a fellowship at Oxford, and earned other professional credentials and accolades too numerous to list here. We don't know or care about Pielke's political views. We only know he is a man genuinely devoted to scientific discovery. "I believe climate change is real and that human emissions of greenhouse gases risk justifying action, including a carbon tax," Pielke wrote last week for The Wall Street Journal. "But my research led me to a conclusion that many climate campaigners find unacceptable: There is scant evidence to indicate that hurricanes, floods, tornadoes or drought have become more frequent or intense in the U.S. or globally." That's a problem for Big Global Warming, a quasi-industry of activists, special-interest journalists and politicians who drive funding by claiming each tornado, hurricane and blizzard proves urgent need to publicly fund more research. The Journal titled Pielke's article: "My Unhappy Life as a Climate Heretic: My research was attacked by thought police in journalism, activist groups funded by billionaires and even the White House." WikiLeaks released an email before the election that documents a staffer at the Center for American Progress, founded by Hillary Clinton campaign manager John Podesta, taking credit for sabotaging Pielke's writing position at Nate Silver's FiveThirtyEight website. A center staffer brags to billionaire donor Tom Steyer: "I think it's fair (to) say that, without Climate Progress, Pielke would still be writing on climate change for 538." Pielke testified before Congress in 2014, showing the economic and human burdens of natural disasters are smaller than in the past. That made him a target of Obama science adviser John Holdren, who published a nearly 3,000-word screed on the professor "chock-full of errors and misstatements." 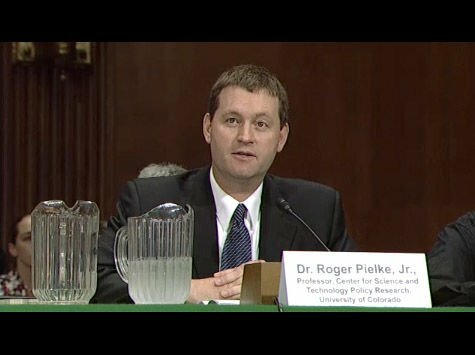 Next came a letter to CU President Bruce Benson from the ranking Democrat on the House Natural Resources Committee, explaining Congress was investigating Pielke for "serious misstatements by Prof. Pielke of the scientific consensus on climate change." The letter demanded financial disclosures, suggesting Pielke was on the payroll of Exxon Mobil. "The University of Colorado complied with Rep. (Paul) Grijalva's request and responded that I have never received funding from fossil-fuel companies," Pielke wrote in the Journal. "My heretical views can be traced to research support from the U.S. government." Pielke's article details reporters and publications who blacklisted him for documenting how climate change was not causing more intense or more frequent natural disasters. After Los Angeles Times Pulitzer Prize-winning reporter Paige St. John quoted Pielke, she "was pilloried by her peers in the media." Censors and bullies never disproved Pielke's research, but they wore him down. He acknowledges CU's supportive administration and regents, but says "a lone academic is no match for billionaires, well-funded advocacy groups, the media, Congress and the White House." Pielke has left the Environmental Studies Program to pursue his other passion, athletics, as CU's director of the Sports Governance Center. CU has done a stand-up job supporting Pielke and other faculty who challenge conventional wisdom, censorship and establishment group think. We wish Pielke all the best, but urge him never bury his climate change findings.